Milagros Lecuona is originally from the Canary Islands, Spain. After living in several cities around the world, she moved to White Plains where she has been a resident since 1987. Before coming to the U.S., Milagros lived in Guadalajara, Mexico where she taught at the School of Architecture ITESO and co-owned an art school. Milagros holds a BS in Architecture from the University of Madrid Spain, where she majored in Urban Planning, and holds dual master’s degrees from Columbia University’s School of International and Public Affairs (SIPA) and School of Urban Planning (GSAPP). She has more than 30 years of experience in Architecture and Urban Planning. For the last 15 years, Milagros has been working primarily on educational and cultural facilities and prior to that, she did extensive construction and design work on health care facilities and laboratories. She is the principal at Lecuona Associates, an award winning architectural design and urban planning consulting firm in White Plains. She is an assistant adjunct professor at the GSAPP urban planning masters program and at the SUNY Empire State College. She is a former member of the Westchester County Planning Board, the White Plains Open Space Acquisition Advisory Committee and the White Plains Cable Commission. She was co-president of the WPHS-PTA. Currently, she is the chair of the White Plains Sustainability Committee, and represents the City of White Plains on the Long Island Sound Water Inter-municipal Committee (LISWIC). 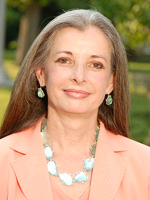 She is a member of the White Plains Budget and Management Advisory Committee and the White Plains Historical Society. Milagros is a board member of the Westchester Hispanic Coalition and a member of the White Plains Volunteer Fire Fighters. Milagros Lecuona has been a councilwoman in the City of White Plains since 2008. She is a strong advocate for responsible and efficient growth, the protection of the built and the non-built environment, and the preservation of the city’s beautiful and diverse neighborhoods. One of Milagros’ priorities as a city council member is to assure that policies are universally inclusive physically, economically and socially. She finds it rewarding to put her knowledge, experience and creativity to work for better communities and hosts and produces a radio show called “Livable cities.” She enjoys performing with the Taconic Opera Company. Milagros got her respect for nature growing up in the Canary Islands, her appreciation for music from her parents and her devotion for community service from the residents of White Plains. She has two grown children.